Four models help control calcium scale and hardness problems. Helps control calcium scale problems!!! 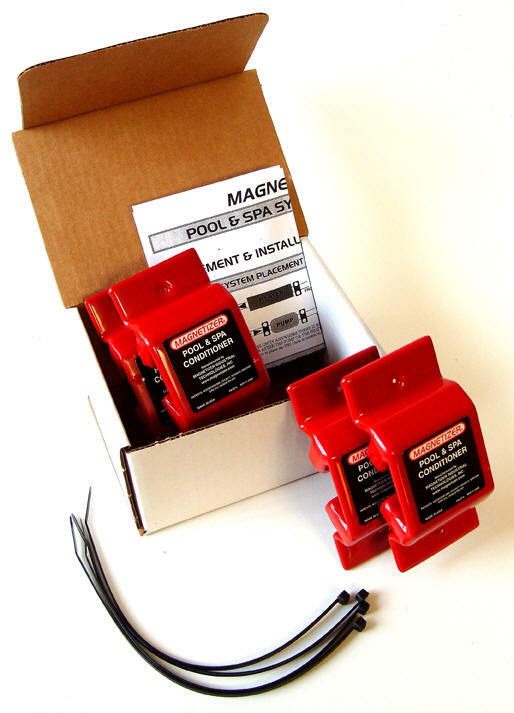 Scroll down to browse through information about Magnetic Water Conditioners. High levels of calcium hardness can lead to scaling conditions and cloudy water. Magnetic Water Conditioning is a non-chemical solution, for hard water problems. The Website Store Directory contains an alphabetized listing of all products for sale. We don't just sell products. We help you make a better-informed choice, by providing all the information, you might require. Need ordering help? Scroll down the page, for the Order Desk Telephone Help Number. All items ordered will end up in the same shopping cart, no matter which page of this website, the items are located. All Major Credit Cards and PayPal are accepted. Order one today. Save Time and Money!!! Get silky, clear water. The solution, for many calcium hardness problems. 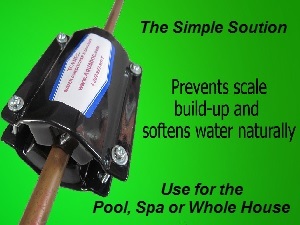 A simple and effective patented, premium-performance magnetic water conditioner is now available for your pool and spa. 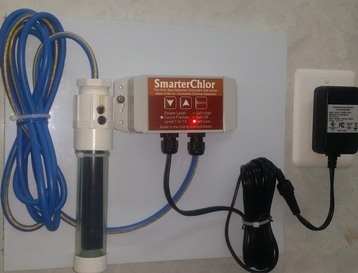 Laboratory tests prove, that by simply strapping the Magnetizer on the return line to your pool or on the heater line of your spa, the Magnetizer helps reduce sanitizing chemical usage. By helping to stabilize the pH and eliminating many pH chemicals, chemical costs are reduced. 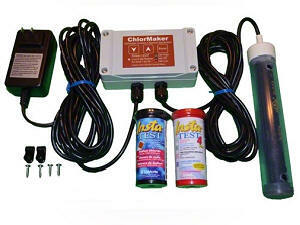 The Magnetizer helps to eliminate algae, helps keep the water cleaner and improves the clarity of your pool or spa. The Magnetizer won't lower the actual calcium hardness readings, but will help eliminate the negatives effects, through the use of its magnetic restructuring capabilities. As water molecules pass through the powerful and highly focused magnetic field, the Magnetizer Pool/spa System does two things: Polarizes (organizes) molecules and gives water a net positive (+) charge. This physically restructures the water making it provide all the great benefits: reduced eye and skin irritation, reduced chemical odors and better feeing water. This removes ugly scale, protects equipment and allows for your heater to operate at scale-free, peak efficiency, thereby saving you many energy dollars. 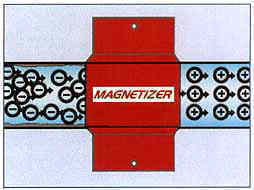 One set of Magnetizers shown strapped around a pipe. Includes two sets, for a total of four magnets. • The Magnetizer, with its 2000 gauss magnetic strength, operates automatically, continuously and permanently, using no external power source and has no moving parts to wear out. A Lifetime Power Warranty, a lifetime of savings, and Magnetizer conditioned water is the natural way to enjoy your pool, Spa or SwimSpa. Designed for premium performance. • Bromine, chlorine and other chemicals used in your pool maintenance mix more completely and effectively in magnetized water. The reduced surface tension and the increased ionic activity of the magnetized water helps to reduce operating costs as well as reducing chemical needs. Wide variations in pH can damage equipment, while frequently reducing the effectiveness of the chemicals. By magnetically organizing the water molecules, the range of the pH is reduced, as is the need for chemical usage. • Pool and spa users report less scum caused by body oils and less build-up caused by hard water minerals. The result is a more luxurious swim, with less chemical irritation to the eyes and skin. Why put up with hard water problems, when there is such an easy solution? • Installation is simple, as it simply is clamped or fastened around all of the standard sized swimming pool or spa pipes. It does not have to conform exactly, to the diameter of the pipe, when being used with a plastic pipe. • Model 4565 will fit pipes from 1" (2.54 cm) to 2.5" (6.35 cm) in diameter and is fastened around the pipes using plastic ties. 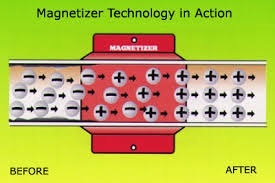 When plastic pipes are used, The Magnetizer does not have to conform to the exact diameter of the line. Although Pool, Spa or SwimSpa water can remain usable for long periods, over time it can become saturated with waste byproducts and chemicals. The Tormec Pool Model and Spa-SwimSpa Model Magnetic Water Conditioners help in two important ways. Particles that might pass right through some filters, take on an electrical charge, causing them to coagulate into larger particles. These larger, coagulated particles are more easily removed, by filtration. Because fewer chemicals are required, with a Tormec system, there is reduced chemical build-up and reduced tendency to scale build-up. This results in less water being wasted and a reduction in chemical usage. To treat whole house there are two (2) models, providing a range of benefits, without the use of chemicals or salt. • Eight (8) more powerful magnets achieve better results, removing scale and protecting equipment. One Collar set with 8 magnets. For all types of pools, up to 30,000 gallons. For pools over 30,000 gallons, the Tormec Tandem features to sets of clamps, for a total of 16 more powerful magnets. • For Spas and SwimSpas, Four (4) powerful magnets achieve better results, removing scale and protecting equipment. One Collar set with 8 magnets. Suitable for small koi ponds. • Simple to install. Fits pipes up to 2-inches. ● More Powerful, Premium-Performance Designs. • Requires no power connections. • The normal pH operating range, for pools and spas, is between 7.2 and 7.8. Above that range scale can begin to form on underwater surfaces, if the calcium hardness is above 400 PPM and the pH is too high. • If the pH falls below 7.2, corrosion can affect metal parts of the heater, filter, pumps, ladder, rails, etc. • Acidic conditions can result in etching of masonry surfaces, which add to the calcium hardness level and subsequent problems. • The cleaned and dissolved surfaces release byproducts, that could add to water quality problems. The Tormec unit helps breaks up the emulsified byproducts. keeping it in suspension, until it can be filtered out. • Factory Warranty: for Life against loss of magnetic power. • A larger and more powerful unit can be used to treat the household water, by attaching to the cold and hot water lines. Includes 2-sets, one for each line. • Beats out the competition with our New Super High Powered 8 Magnet Clamp model. • Installs in seconds. No plumbing. No tools. Simply clamps on to water pipes and it silently works, when the water flows. • No moving parts to wear out. It lasts forever. • Water feels softer. Soap works better. Clothes become cleaner. Hair is softer and silkier. Unsightly lime scale and stains are reduced and easily wipe away. • Water tastes and smells better, as sulfur and chlorine odors are greatly reduced. • Kitchens and bathrooms will look new again. Ugly stains on sinks, tubs and toilets begin to soften and clean up. • Water pressure will increase, as the scale build up in pipes is reduced. • Saves money year after year! Saves on your hot water heating costs. Water heaters will no longer be coated with that hard water scale that reduces your hot water heater efficiency. • Factory Warranty: for Life against loss of power. 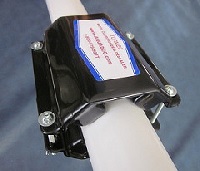 • Fits all types of water pipes, from 1/2" to 1 1/2 " diameter. • The complete home system includes two sets - one for the hot water line and one for the cold water line. • Easy-to-follow instructions show exactly where to place them on your water pipes. 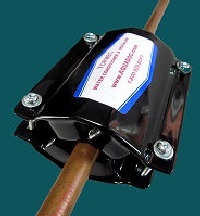 Magnetic Water Conditioners . . . help solve calcium hardness problems!!! Allows for portable use of Chlorine/Bromine/pH 3-use Spin Disks. Graphic Mosaic Mats Just simply position on pool floor. Weighted to stay in place. Easy!! !